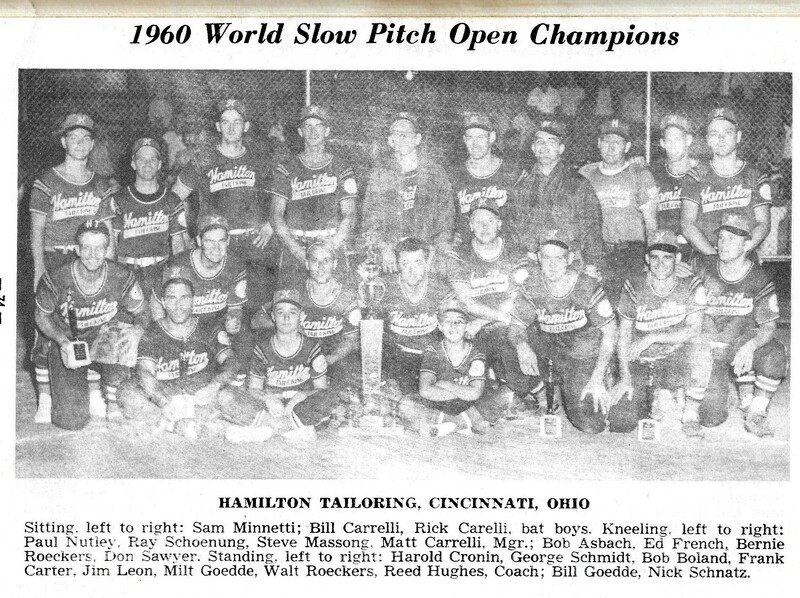 1960 held at Richmond, Virginia. The High Point Glass Rockets completed their undefeated season by sweeping through the National Tournament in three straight games. 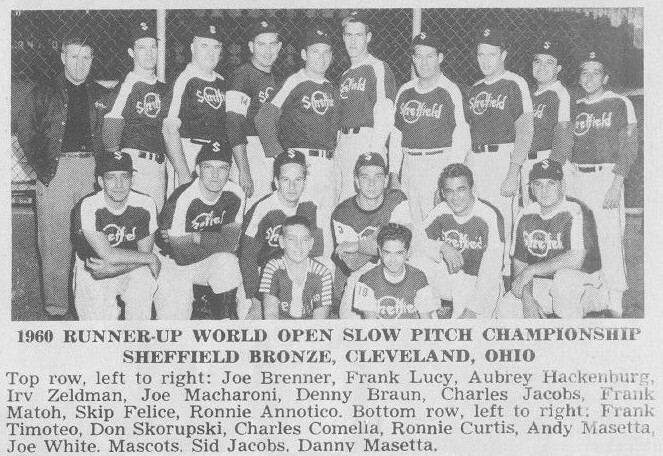 Pitcher Peggy Andrews allowed only 18 hits in 21 innings. She surrendered just 3 runs and pitched a 2-0 shutout in the Championship Game. Andrews also wielded a hot bat also. 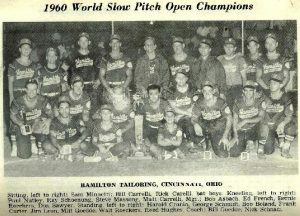 Heidel’s Hall Nancy Conners started off the tournament tossing a 3-hitter over St. Patrick’s of Louisville, KY as Heidel’s banged out 28 hits in an 18-1 triumph. A young lady by the name of Nancy Oldham started out her Hall of Fame career playing for the High Point Carolina Glass Rockets. 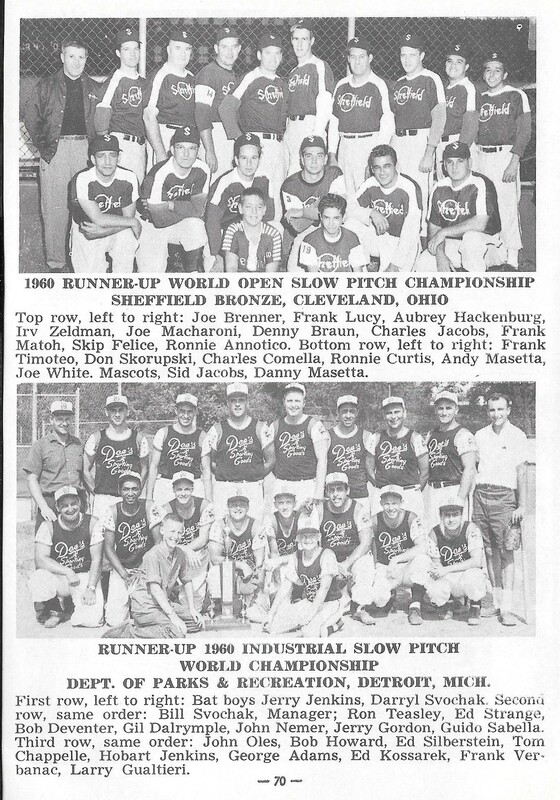 From 1957-60, the Women’s Nationals were actually called National Invitationals, the Women’s Open Nationals Officially started in 1961. From 1961-63, the Women’s Open Nationals had a consolation flight. 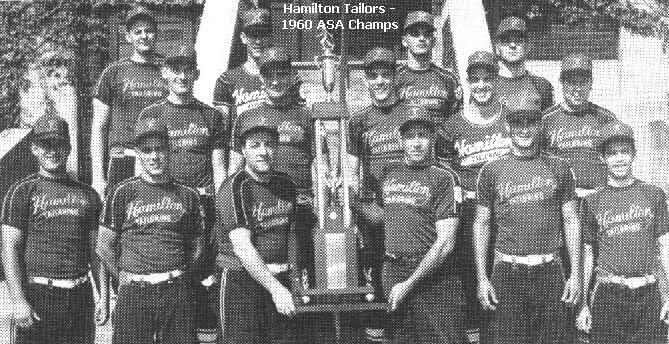 After being dropped to the loser’s bracket by losing to Sheffield 12-9, Hamilton Tailors had to win five straight games and did so with the pitching of Sam Minniti, defense of Third Baseman, Don Sawyer (who made diving grabs to rob Sheffield of at least 4 hits). 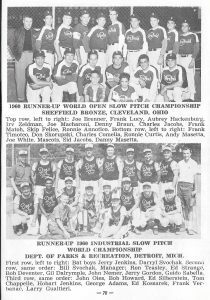 Sheffield defeated Buckhorn Cafe of Toledo in the winners bracket final 16-7. 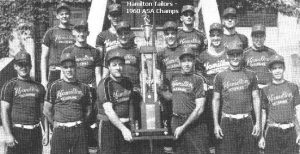 Hamilton Tailors came back to eliminate Buckhorn 16-5 in the semi-final to set the stage for the championship against Sheffield Bronze. 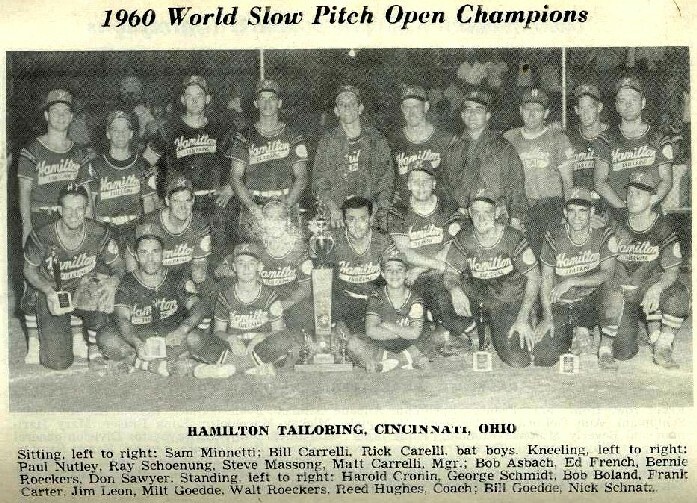 With Sam Minniti on the mound, The Tailors defeated Sheffield twice; 12-4 and then 17-2 to claim the title. 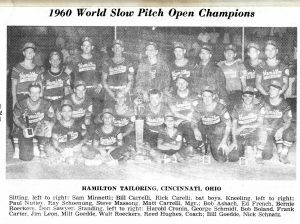 Bernie Roeckers was 4-5 with 2 doubles, 3 runs scored and 3 RBIs in the final game. Sam Minniti surrendered 14 runs in the five straight wins to the title after the loss to Sheffield. Including the 12 runs he gave up to Sheffield in the loss, Minniti gave up just 41 runs in the 10 games. He was 9-1 in the tournament.